Mike Gundy Cowboys Up, rides mechanical bull. Oklahoma State head football coach Mike Gundy doesn't have to prove that he's a man, because he's already done that. And he's man enough to have a Justin Beiber ringtone, as well. And because he is a man, he can ride a mechanical bull with the the ease of Lane Frost riding Red Rock. The following video was filmed somewhere in Arizona, where he and the team are preparing to face Stanford in the Fiesta Bowl. Game Day Goulash: Bowl games, Andrew Luck, Aaron Murray, and way too much griping about New Year's in the ATL. At left is the Peach Drop, the annual New Year's Eve event in Atlanta, which is officially the lamest New Year's Eve celebration in America. Seriously, I've been down there to see it live, and it's awful. Loads of drunk people with the warm smell of colitas rising up through the air. And the spectators who crowd Blunderground Underground Atlanta each year for the Peach Drop get gipped. That's because the "peach" being dropped is a flattened piece of peach-shaped material. It's not even a spheroid like the ball in Times Square, for crying out loud! It's the It's Great Pumpkin, Charlie Brown "I got a rock" equivalent of New Year's Eve. Seriously, the ATL can do better. Maybe they could Chick-fil-A to sponsor it like it does the Chick-fil-A bowl and drop a cow or something. 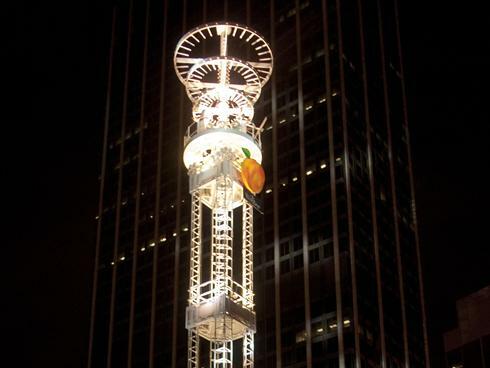 Okay, enough of the griping, you're here for the news round-up and surrounding snarky comments and obscure references, not the griping about the Peach Drop. So here goes. BYU and Tulsa are neither Armed, nor are Forces. Discuss amongst yourselves. Maybe the last time. I don't know. 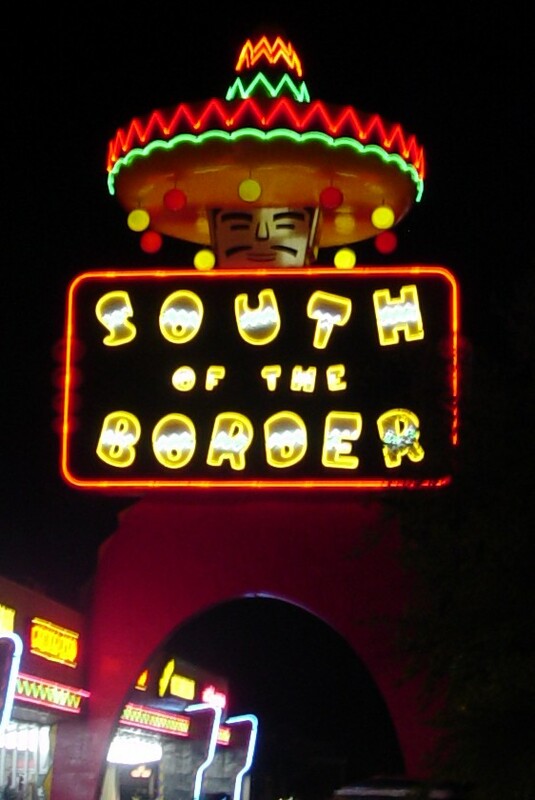 Out in the West Texas town of El Paso. Let's dance. Let's shout. Shake your body down to the ground. The Island of Misfit Bowls. 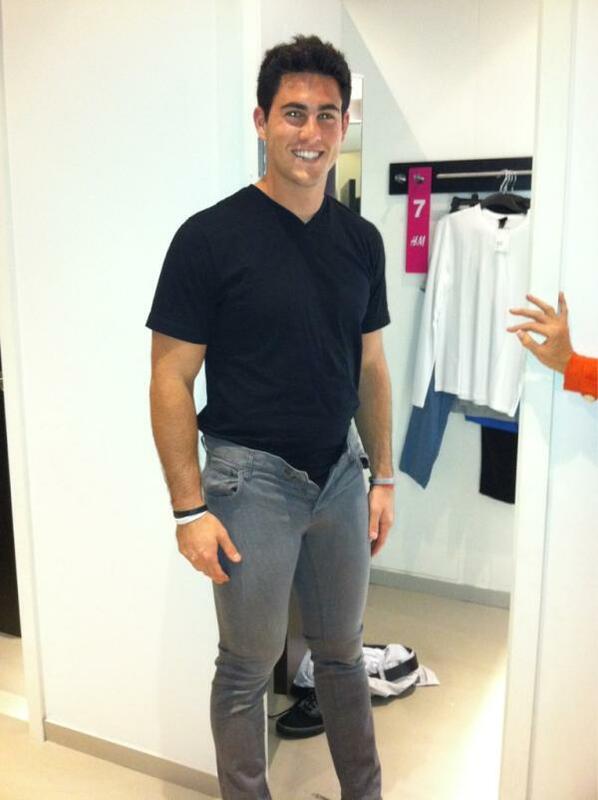 UGA QB Aaron Murray's latest fashion nightmare. 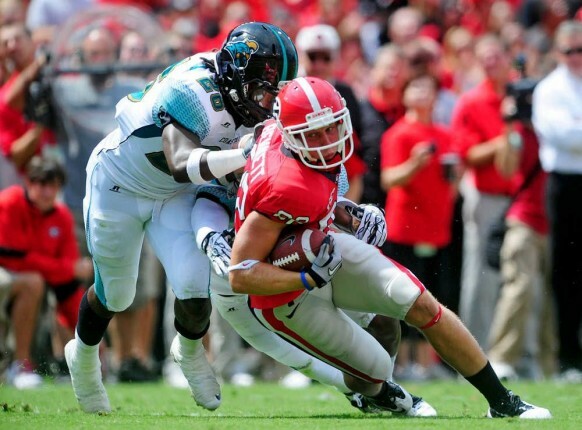 Thank you, Aaron Murray! 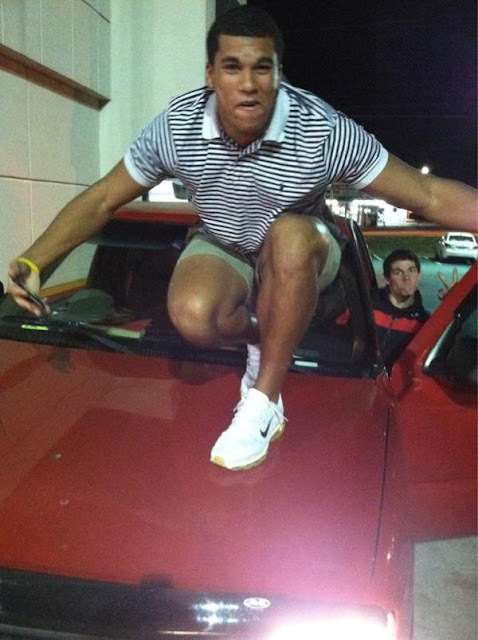 We couldn't have ended 2011 without at least one last embarrassing photograph from our favorite Georgia starting quarterback. 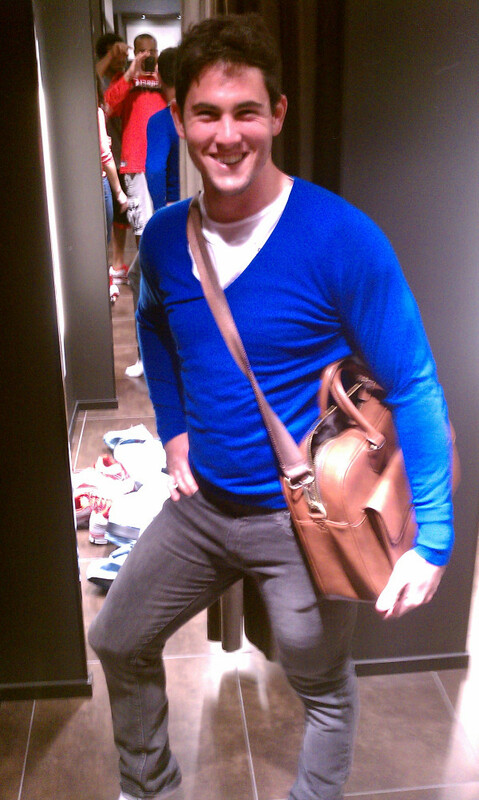 This time Murray went all out with the deep-cut v-neck sweater, skinny jeans, and a larger-than-necessary and all too feminine carry-all bag. Add to that the derp face to end all derp faces, and all confidence that the Dawgs will beat Michigan State in the Outback Bowl will pretty much vanish. Did I mention Murray's skinny jeans? Uh, Aaron, I think you forgot to do something before you got you picture taken there. Aw, screw it. Georgia's doomed. 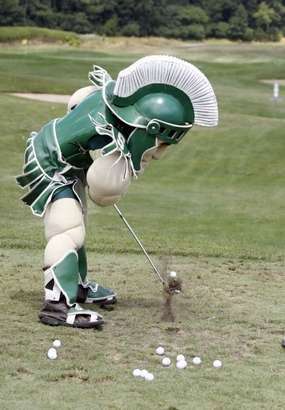 Will Michigan State play USC in Greece? 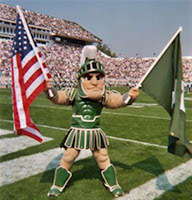 Could Sparty fly the colors in Greece? Greece is the word for Michigan State athletic director Mark Hollis. Apparently is isn't good enough for MSU to re-enact the Peloponnesian War against Georgia on Jan 2., 2012 in the Outback Bowl. 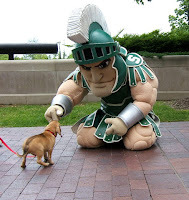 (Spartans vs. Georgia, get it? Oh well...) Hollis wants to play a basketball game in Greece, the home of the original Spartans, as well as the birthplace of the ancient Olympic Games. He even has the perfect opponent in mind - the USC Trojans. "And yes, Hollis is serious about a game between Michigan State and Southern Cal in Panathinaiko Stadium in Athens, Greece – which hosted the first modern Olympic Games in 1896. “We’ve been talking about Greece for a while,” Hollis said. It would have to be a basketball game, though, because the stadium is too narrow for a football game. All sports will be involved in the new scheduling and branding partnership that the Big Ten and Pac-12 announced Wednesday." Clearly, Hollis apparent vision is for Michigan State and USC re-enact the Trojan War, hoopyball-style. (The Trojan started when a Trojan prince ran off with Helen, wife of the King of Sparta) Since Michigan State played North Carolina on the deck of the USS Carl Vinson this past Veterans Day in the first Carrier Classic, anything is possible. And with the new partnership between the Big Ten and Pac-12, the idea seems a perfect way to take full advantage of the agreement. Still, a football game between Michigan State and USC in Greece would make the Trojan War analogy a little more appropriate. Maybe the Original Olympic stadium is too small for football, but there certainly are soccer stadiums big enough for a college football game. 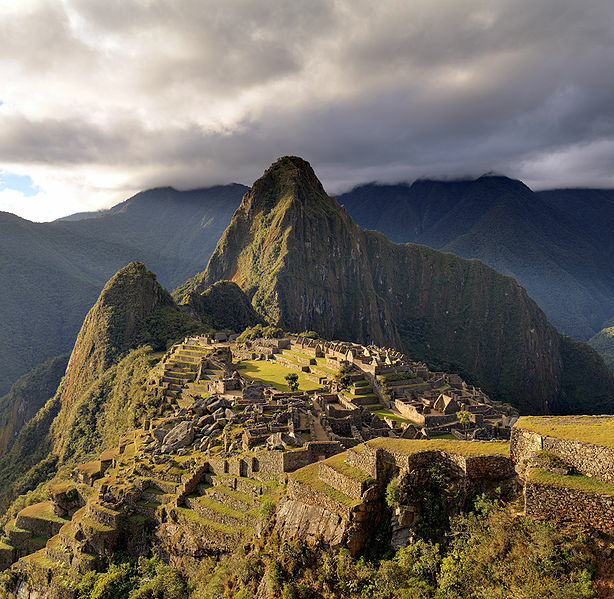 Add in a giant wooden horse, and things would be perfect. Big Tentacles: Isaiah Lewis, Mark Dantonio, and an alligator. Mark Dantonio brings an alligator to Michigan State's Outback Bowl practice. Oh yeah, well we've got a stuffed monkey. Beat that! Time Is On My Side? Covering Dixie Like Mildew: Les, Miles, Jarvis Jones, DeAnthony Arnett, and more. 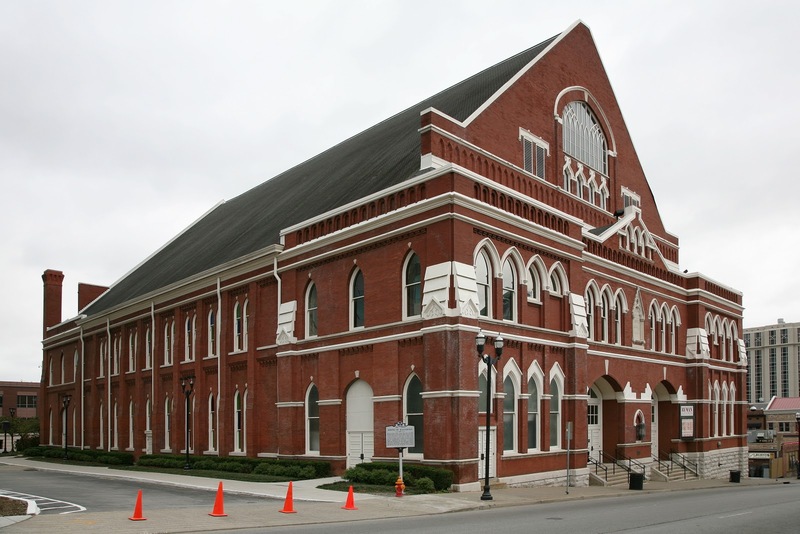 Nashville Cats Dogs, play clean as country water. Stop Me If You Think That You've Heard This One Before. Big Tentacles: Mark Dantonio, Bo Pelini, Penn State, and more. Penn State job doesn't look like much now, but it cleans up well. Penn State is the new SMU. Bo Pelini is not leaving Nebraska. Covering Dixie Like Mildew: Mark Richt, Brad Wing, Les Miles, and more. Done, done, on to the next one. Heavy, heavy, you got so heavy on me. Steve Spurrier: International Man of Mystery. I see the future, and it works. 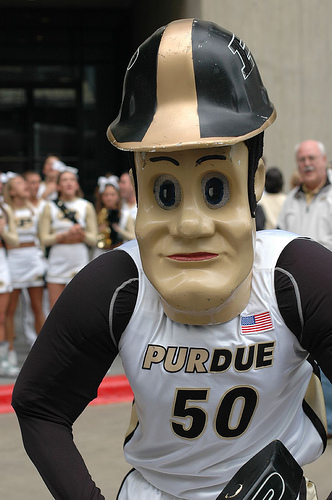 Big Ten and Pac-12 expand partnetship into regular season. The Big Ten and the Pac-12 are expanding a partnership that goes beyond the Rose Bowl and obstructing any kind of playoff in FBS division college football. The new deal means that the conferences will increase regular season interconference play and pimping each others' conference on the conferences' respective cable networks. "The new agreement will tie them throughout the regular season, as well — and in all sports, though football and basketball are the focal points. By 2017, each team's nonconference football schedule will include one game against a team from the other league. One could be featured annually as a preseason kickoff event, perhaps staged at the Rose Bowl. Others could be played in neighboring NFL stadiums, including the planned Farmers Field in downtown Los Angeles, the San Francisco 49ers' new facility or Chicago's Soldier Field. Basketball games similarly could land in such NBA arenas as Los Angeles' Staples Center or Chicago's United Center, four teams sometimes gathering for doubleheaders." The new Big Ten/Pac-12 agreement could be seen as a healthy step in increasing the competition level the between the BCS conferences. Similar agreements with the other conferences would go a long way in making non-conference play more enjoyable. On the other hand, this can be seen as the two conferences trying to separate themselves more from the rest of the BCS schools, which doesn't bode well for the elusive dream of a playoff in Division I football. Dancing in the Ruins: Texas, Oklahoma State, Craig James, and Texas A&M. 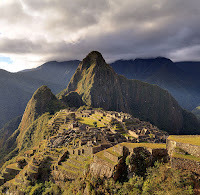 If we took a holiday, took some time to celebrate just one day out of life, it would be, it would be so nice. Standing in the Shadows of Luck. Dubious achievement of the bowl season. Texas A&M's move to SEC named the top Aggie story of the year. Time for a big-time BCS title game halftime show? A recent article in the Baton Rogue newspaper The Advocate discussed the expenses LSU and Alabama were having to pay to have their marching bands perform during halftime at the BCS title game. "LSU senior associate athletic director Herb Vincent said the school needs 529 tickets for its band, cheerleaders and support staff. At $350 each — the highest face-value cost for BCS tickets because of their location — that’s $185,150 the school must pay. The allotment for Alabama’s band is slightly more. Deborah Lane, assistant vice president for university relations, said the Alabama band needs 539 seats for a total cost of $188,650. Overall, Vincent said, the total bill for the LSU band’s appearance at the BCS game will run to $445,150, including transportation, three night’s lodging, meals, police escorts and other miscellaneous costs. Alabama did not provide the total amount for what it will cost to get its band to and from the game, though it’s easy to figure that its costs will be similar. That means it would be about $1 million combined for both bands to appear at the game." That's a lot of money for schools to dish out for a couple of marching bands whose halftime performances will in all probability be only seen in full by the attendees of the BCS title game. This in a time where universities are having to tighten the belts wherever they can. The costs to universities to send their marching bands to the BCS title game does bring up the question of whether the traditional-style college football halftime marching band performances should continue, or if it should be replaced by something else. Namely a Super Bowl-style halftime show musical performance. College football traditionalists will probably scoff at such an idea, but facts are facts. The costs to schools for their football teams to play in mostly meaningless bowl games are going up, and the profitability (if any) of the trips is going down. It reported that Clemson will lose $185,000 for the Tigers' trip to the Orange Bowl. Bowl season is putting schools in the red as much as Christmas does some consumers. The best solution is to keep the band members home, and go with a sponsored BCS halftime show featuring a nationally-known recording artist that (in theory) will keep viewers from turning the channel during halftime. This becomes more important if the game itself is either boring or has become a major blowout for one team over the other, or both. Back in the 1990's, when Super Bowls were getting the bad reputation for being boring blow-outs, competing networks were starting to try to lure viewers away with counter-programming during the usually boring halftime shows that featured forgettable dance numbers and acts like Up With People. Remember the infamous live edition of In Living Color that FOX aired to compete with the Super Bowl XXIV halftime show? (Richard Gere and Carl Lewis do, thanks to the "Men on Football" sketch.) It's one of the reasons the Super Bowl started booking big-time acts like U2 and Bruce Springsteen. ESPN, who currently holds the rights to the BCS title game, probably wouldn't shell out the big bucks for U2, but it could definitely pay to get somebody well known (or at least notable) to perform during halftime. There are certainly enough up-and-coming performers who would jump at the chance for such a high-profile gig. The same goes for any number of acts who's notoriety has cooled down a bit. Simply put, the economics of the game are making it harder for schools to justify sending their marching bands to the BCS title, where their performances will only be seen by a few thousand people. The BCS is going to have to sooner or later going to have to go the way of the NFL and go to a big-time halftime show that would keep viewers from channel surfing. Even if that does mean having to bring in Kenny Chesney for the job. Big Tentacles: Kirk Cousins, Mark Dantonio, Dan Persa, and more. You call be Cesar in a dark Caesar. Putting the icing on the cake. Taking It All Too Far. Twin sons of different mothers? Covering Dixie Like Mildew: Mark Richt, Les, Miles, Derek Dooley, and more. Les Miles in a Santa hat? 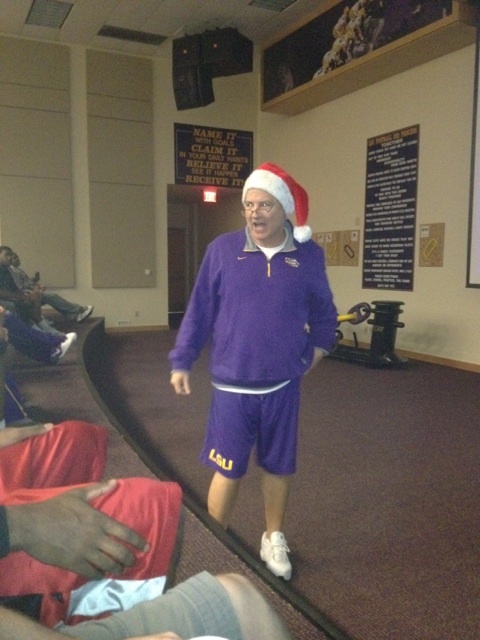 Les Miles in a Santa hat. This is one of those images that really doesn't speaks for itself, doesn't it? Needless to say LSU head football coach does his "Mad Hatter" nickname justice with this image, taken from LSU wide receiver Russell Shepard's Twitter account. Welcome to the Fallout: Charlie Weis, Bob Stoops, and more. Southern Miss is Big Kahuna in Hawaii Bowl. Bob Stoops on the Hot Seat? Wishin' and hopin' and thinkin' and prayin'. Be sure the remember the true reason we celebrate Christmas. Game Day Goulash: Chris Petersen, Matt Barkley, Joe Paterno, and more. The Mirror Has Two Faces. Game Day Goulash: Matt Barkley, Georgia, Ohio St., and more. Okay, this isn't quite a game day. Unless you consider last-minute shopping at the mall head-to-head competition. Let's just call it a gateway to the heart of the the bowl season and get it over with. Clemson the top storyline in the ACC for 2011. USC deserved harsher penalties for its NCAA rules violations than Ohio State did for theirs. Those were the days, my friend. We thought they'd never end. Georgia offensive coordinator Mike Bobo recalls the 1998 Outback Bowl, where as a quarterback he led the Dawgs to a 33-6 victory over Wisconsin. Back then Bulldog fans actually liked him. (The Athens Banner-Herald). Iowa is "The Harvard of Coaching." LSU welcomes Missouri to the SEC jungle. The South is known for it's hospitality. So it's not that big of a shock that LSU placed this ad in The Shreveport Times featuring the cosplaying version of Mike the Tiger to send best wishes to newest SEC member Missouri in the 2011 AdvoCare Independence Bowl on Dec. 26. It also invites LSU fans to go watch Mizzou face UNC. A nice Christmas gesture from the main Tiger-nicknamed school in the SEC West to the newest Tiger team. (Yes, Auburn gets points away that War Eagle thing). 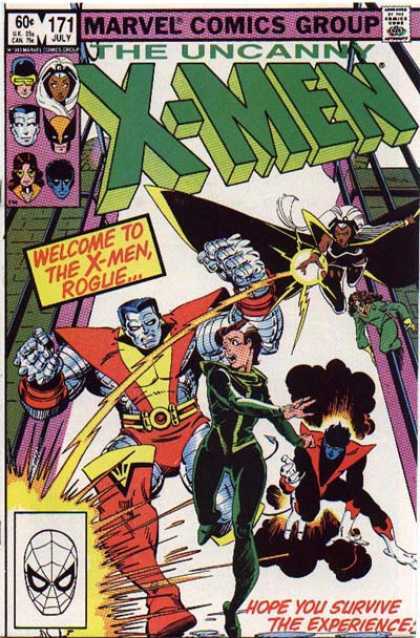 Still, it would have been funnier if the ad were something a little more on the lines of this classic Uncanny X-Men cover. A far more accurate description of how things are going to be for Missouri (and Texas A&M) in the SEC if there ever was one. Virginia Tech Hokie kicker winds up in the pokey. Virginia Tech kicker Cody Journell won't be making the trip to New Orleans with the rest of the team for the Sugar Bowl. This is because this particular Hokie was suspended by the school after being arrested by Blacksburg, Va. police on charges of breaking and entering. "Blacksburg Police say the 20-year-old Journell was one of three men charged Wednesday night, after an alleged home invasion. Police said the men were arrested after officers responded to a report of a “physical altercation” at a house near downtown. Journell, a redshirt sophomore from Ripplemead, Va., was 14-for-17 on field-goal attempts this season. Athletic director Jim Weaver said Journell has been suspended. The 17th-ranked Hokies play Michigan in the Sugar Bowl on Jan. 3." Obviously having a Hokie in the Pokey isn't exactly pleasing for Virginia hed football coach Frank Beamer. Don't be shocked if Journell is an ex-Hokie before long. If these charges end up being true, Journell is a real turkey for breaking into a house at Christmas. There didn't seem to be a site on the Internet that collected college football related hashtags, so I made this one. Please note this list isn't complete, as all teams and hashtags aren't fully represented. But I'll keep this list updated as time allows. The hashtags listed are the ones that appear most in a search on Twitter. Just a little advice I've come to find out with hashtags. Team names will get you what you're looking for sports-wise a little better than school names. Also, if you use a hashtag for a school like #Georgia or #Florida, you make get more generic tweets related to the state than the school itself. Terry Bowden Zip-lines into Akron. There's a Bowden back in the ranks of FBS division coaches. Terry Bowen has left his job as head football coach at the Division II North Alabama to become head football coach at Akron. Bowden coached at Auburn from 1993-1998. He had been coaching North Alabama beginning in 2009. Continuing with this weeks collegiate Christmas tree meme, it a given that I'd get around to Alabama sooner or later. And what an Alabama tree it is! 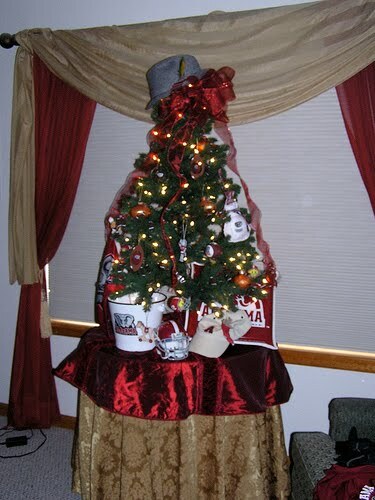 Like any self-respecting Alabama-themed tree, this one is topped with a Bear Bryant-esque hat. Sadly, it isn't the classic houndstooth hat, but one must adapt what they have on hand, I suppose. Georgia player wears Michigan State shorts to team meeting, gets called out by coach. The Aaron Murray fashion faux pas bug is apparently infecting his fellow teammates at Georgia, namely wide receiver Michael Bennett (at left). Bennett was busted by a Bulldog assistant coach for wearing a pair of Michigan State shorts to a wide receiver meeting during team practices for the Outback Bowl. Georgia is playing Michigan State in the Outback Bowl on Jan. 2. OOPS! "Assistant coach Tony Ball called him out in front of his teammates, who are preparing to face the Spartans in the Jan 2 Outback Bowl, and asked Bennett to explain what he was wearing. Bennett grew up a Spartan fan, as his father was a Michigan State alum. The family attended the last meeting between the Bulldogs and Spartans in the 2009 Capital One Bowl (Georgia won 24-10). Bennett "wore green and white" for the game. After living in Georgia for 16 years now (the family lives in Alpharetta). Jon Bennett said he’s not quite as big of a Spartans backer as he used to be, but some things remain the same. “We still hate the Wolverines, we still hate the Buckeyes,” he said." I'm sure Mark Richt would love to hear that from his freshman wide receiver who made 31 catches this season, along with five touchdowns. Bennett will be okay just as long as he doesn't go full throttle Aaron Murray and get caught wearing Michigan State gear on the internet. Covering Dixie Like Mildew: Mike Stoops, Robert Lester, Mark Richt, and more. Meaningless bowl item of the day. The High Cost of Winning. Brutus won't be smiling for long. The Apocalypse has come to Columbus, Ohio. The Columbus Dispatch is reporting that Ohio State will be banned from postseason play by the NCAA in 2012. This as result from the Tresselgate scandal involving players receiving improper benefits, and former head football coach Jim Tressel's failure to report the incident. Oh wait, it gets worse. The NCAA dropped the banhammer even further. * Strip four more football scholarships over the next three years on top of Ohio State’s prior forfeiture of five scholarships over that span. * Add an additional year of probation to OSU’s self-imposed two-year probation for the football program, meaning any violations through the 2013 season could draw harsher-than-normal penalties. The NCAA also will hand a show-cause penalty to former head coach Jim Tressel for failing to report that some team members improperly sold memorabilia and for allowing ineligible players to compete throughout the 2010 season." So essentially this means that Urban Meyer is the new Lane Kiffin, whose hire made a big splash, then was overwhelmed when the NCAA made a bigger splash with its sanctions against his new employers (USC, in Kiffin's case). It seems that neither Meyer nor Ohio State athletic director Gene Smith saw this coming out of the NCAA's investigation of the incident. At least they'll get comfort that the Buckeyes will be bowl eligible after the 2013 season. Unless the NCAA sanctions go farther than the Dispatch reports they are. Covering Dixie Like Mildew: Mark Richt, Beef 'O' Brady's Bowl, Knile Davis, and more. The Christmas tree in the lobby of the Peabody Hotel in Memphis. Today is Judgement Day for Ohio State. Adam Rittenberg of ESPN is reporting that the NCAA infractions committee will be handing down its ruling on Ohio State's involvement with Tresselgate Tuedsay afternoon. "Athletic director Gene Smith told the Associated Press that the infractions committee will issue its ruling at 3 p.m. ET. The ruling comes nearly a year after Ohio State revealed that six players had committed NCAA violations by trading memorabilia items in change for tattoos and cash. In March, Buckeyes coach Jim Tressel revealed that he had known about the violations since the previous spring but did not inform anyone else at Ohio State. Tressel's admission led to his resignation in late May." It will be interesting to see if Ohio State's self-imposed sanctions (which included the vacating of all wins from the 2010 season) will be enough to keep the NCAA from dropping the kind of banhammer in the manner it did with USC. New Buckeye head football coach Urban Meyer could be finding himself in the same boat that USC's Lane Kiffen has, facing a ban from the postseason bowls to begin his tenure. Geaux Christmas tree: an LSU Christmas tree. Continuing with this week's series of college football-themed Christmas Trees, here's an LSU tree from around 2009. Not impressed? If you have a college-themed tree in your home, send me an image via Twitter at @SWRTWrightBlan. 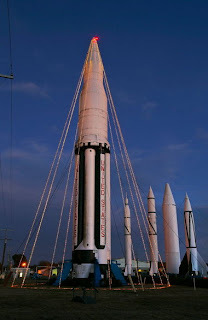 Feel free to follow me there as well. Big Tentacles: Brady Hoke, Dan Persa, Bo Pelini, and more. No, Sparty. That's not a bulldog. I'm Not Perfect, But I'm Perfect For You. Leaving on his own terms. The toxicity of our city. Covering Dixie Like Mildew: Isaiah Crowell, Derek Dooley, and more. Just be patient. I'm a work in progress. All we need is just a little patience. Matt McGloin speaks out on recent altercation with Penn St. teammate. Penn State quarterback Matt McGoin met with the media today and discussed the alleged altercation between himself and teammate, wideout Curtis Drake. McGloin took responsibility for the incident, and referred to his being hospitalized after the incident as due to "a freak accident." He denies that Drake punched him out. "As a quarterback for this university I feel as if I'm held to a higher standard," McGloin said. "I feel as if I'm a role model for younger kids. Coaches look at me to lead this team. I'm man enough to say I'm gonna take responsibility for it. It was my fault. It shouldn’t have happened. With everything going on with this university right now, we don’t need another distraction. "It was immature," McGloin added. "The incident was ill-timed. To put Coach Bradley in this position, the man’s been through enough. My heart breaks for him, and we’re gonna do the best we can to try to fix this." The fight carried into the locker room after McGloin and Drake got into a shouting match during a passing drill. "As [Drake] came over toward me I couldn’t back away," McGloin said. "We just grabbed each other. It didn't last more than 10 seconds." Interlocked with each other, their momentum carried them to the ground. McGloin's left shoulder hit the thin carpeting first, leaving a bruise, and his head snapped back and hit the ground. He called it a freak accident. "That's the last thing I remember," McGloin said. "The last thing I remember is waking up on the stretcher." Here's some video from the meeting with reporters. Dancing in the Ruins: Mike Gundy, Mack Brown, Robert Griffin III, and more. Be True to Your School. 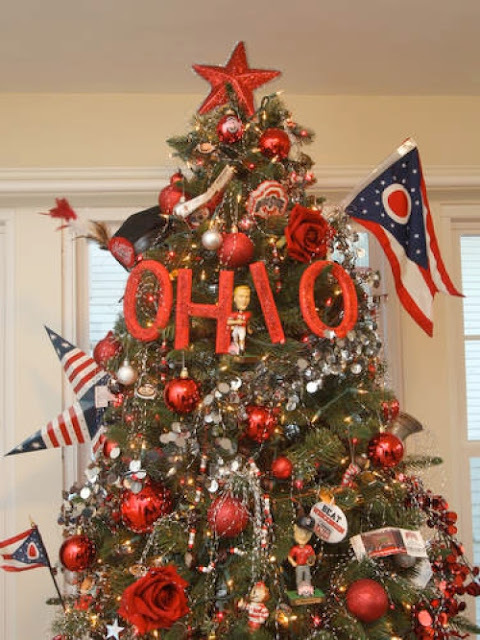 O-H-I-O Christmas Tree: An Ohio State-themed Christmas tree. Since I posted an image of a Georgia Bulldog-themed Christmas tree a last Friday, I might as well post one for an Ohio State-themed tree too. Luckily, none of the ornaments are as disturbing as the decapitated bulldog head on the UGA tree. Those those Tim Tressel anf Kirk Herbstreit bobble heads come close. No Santa in a red sweater vest ornaments, though. That's kind of a letdown. Big Tentacles: Matt McGloin, Urban Meyer, Bobby Knight, and more. Fun Christmas party fact of the day. What a Night for a Knight. Virginia fans' rap video is just sad. LSU punter Brad Wing has his own dance move. Pac-12 begins push into China. The "Mark Richt to Texas A&M" meme will not die. Does Philip Fulmer want to coach Kansas? College football's Naked Lunch of a bowl season. Is Mack Brown Texas Toast?